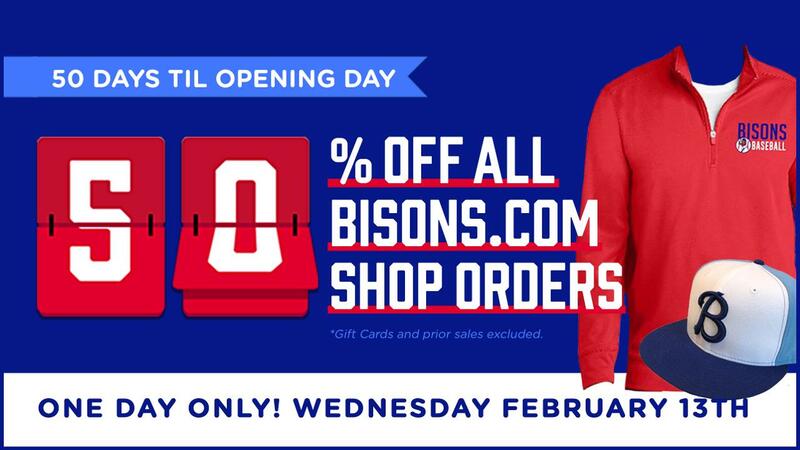 The Bisons fan-favorite "50-Days, 50% OFF Sale" has returned to the Bisons.com online shop for ONE DAY ONLY - Wednesday, February 13. One day with no promo codes and no minimums… just MASSIVE savings to get you ready for the baseball season. Jerseys, t-shirts, on-field caps...we got them all!!! Men's, Women's and Children's apparel, it doesn't matter. The entire online shop is 50% off! Even great items from Nike and Columbia as well as top sellers like the Affiliation Throwback cap and the Urban Camo cap! This year, we've even piled values upon values. The one-day 50% OFF Sale even includes items in the clearance section of the website! CLICK HERE to access the Bisons.com Online Shop to take advantage of these great deals! Want to save on shipping, too? Change your "shipping address" at check out to the ballpark address at Sahlen Field and then select "Pick-Up Only" as your shipping option! You'll receive an e-mail when your order is ready for pick-up including details of when, where, and what you'll need to pick it up. We are just 50 days away from the return of Bisons baseball at Sahlen Field with Opening Day against the Scranton/Wilkes-Barre RailRiders set for Thursday, April 4 at 2:05 p.m.! *Sale does not include Bisons gift cards. Because of demand, jerseys purchased during this sale will ship in late March.